Books will always remain the most inexpensive way to get access to other worlds. They always have been and always will be. I was very lucky that my parents introduced me to books when I was only five years old. I haven’t looked back since. Books and I have a relationship that will never die or fade. I am glad that I am sure of this. So when I saw ‘A Child of Books’ slated for release, I knew I had to get my hands on it and read it – not just once but again and again and again. It is not a children’s book – it looks and reads like one but I don’t think it is a children’s book. If anything, it is for adults who have forgotten what it’s like to be a child. 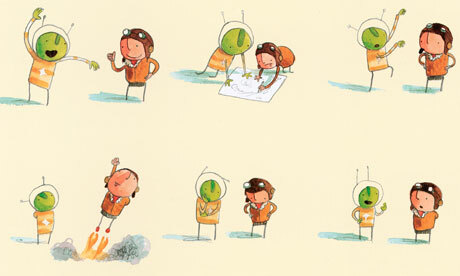 I am also biased to Oliver Jeffers’ books – to me, he cannot come out with a bad book. That is something which isn’t possible. This book is simple – it is a picture book – with words and sentences that are so profound that it will make you sit back and contemplate about whether your child is reading enough or not. It is a love letter to reading and how it does really save us. A girl is besotted by books and reading and helps a tiny boy to take the proverbial plunge to this world of words and emotions. The book is about their journey – through magical lands, fairies and castles and places where anything can happen and those places are only found in books. I think this is the most fitting tribute to books, literature and the books that are so quirkily placed within this book. ‘A Child of Books’ should be read by anyone and everyone who loves books and reading. It is that essential. This entry was posted in 2017 Reads, Authors, Authors I Love, Books, Children's Books, children's fiction, January 2017 Reads, Picture Books, Review, Walker Books and tagged 2nd of January 2017, A Child of Books, Books, Books and Libraies, Children's Books, January 2017 Reads, Lands, Love of Reading, Must-Read Picture Books, Oliver Jeffers, Picture Books, reading, Sam Winston on January 2, 2017 by thehungryreader. Nothing like a good children’s book to make the blues go away. Trust me when I say that. They are very comforting and help you also look at things differently and actually make you more empathetic than you normally are or would have been. At least that has been my experience. 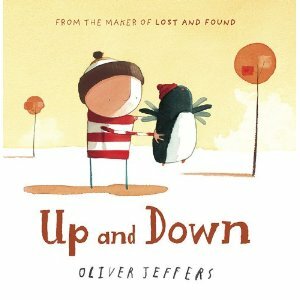 Once again Oliver Jeffers came to my rescue with the book “Up and Down” and might I add that I was again taken in heavily by this one as well. Though this was a reread, it still seemed like I was reading it for the first time. 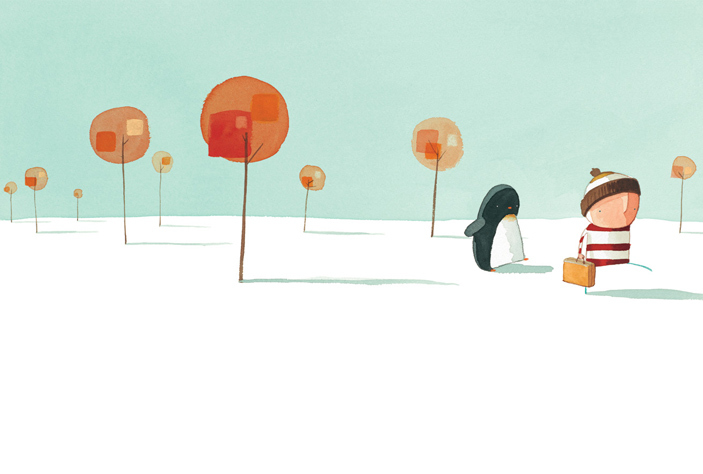 “Up and Down” is yet again about the boy and this time with his friend, the penguin. They spend all time together and are with each other, till one fine day things change. It is about the penguin that has wings and wants to fly and explore more than just spending time with the boy and how one turn of event makes the penguin and the boy see things differently. I loved this book. It is about friendship and how easy it is to get back with friends. It is also about wanting to do what you always have thought and dreamed of. 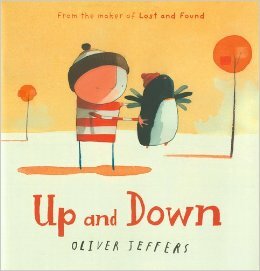 “Up and Down” by Oliver Jeffers is a comfort read. It will for sure make you want to call your best friend and let him or her know how much they mean to you. 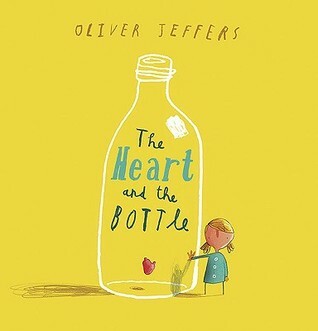 This entry was posted in Authors I Love, Books, Children's Books, Harper Collins, Oliver Jeffers, Picture Books and tagged children's book, Harper Collins, Oliver Jeffers, Picture Book, Up and Down on August 11, 2015 by thehungryreader. 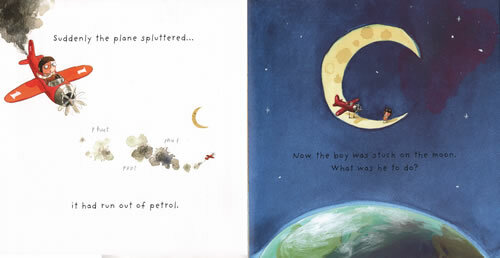 Reading an Oliver Jeffers book is a treat, for both children and adults. I love them. His stories comfort me. The illustrations make me happy and mostly if any sort of art form can do that, then it is meant for you. A boy like any other boy finds an airplane and decides to fly. He flies higher and higher and higher till he is space and runs out of fuel. What happens then? He lands on the moon and it is dark and lonely on the moon and he cannot think of a way of getting back home. In all of this he meets another one who is lost on the moon just like him – it turns out to be a Young Martian. The Martian is apprehensive of the boy initially and so is the boy of the Martian. The story unfolds as they trust each other and eventually find a way back home. The book is a children’s book – that’s for sure, but at the same time, it is quite an insight into us when faced with a stranger. It is about our fears and how perhaps as a child it is easier to accept everyone than as an adult. “The Way Back Home” is a book which will be cherished by all. It is simple and it makes you think about the world we live in which is full of racism, xenophobia, and fear. I write this review while listening to “Imagine” by John Lennon and I hope that the world is different for generations to come. 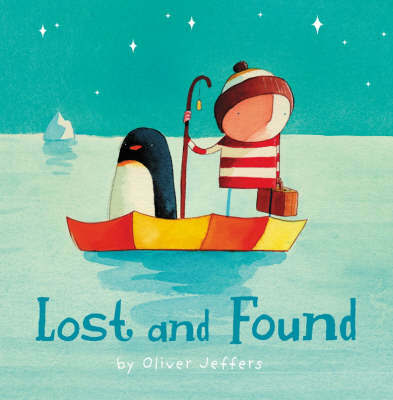 For now, we will read books like these by Oliver Jeffers. 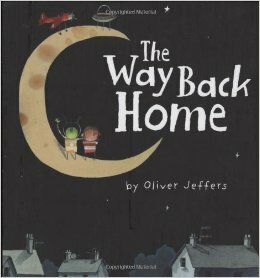 This entry was posted in Authors I Love, Books, Harper, Harper Collins, Oliver Jeffers, Picture Books, Review and tagged alien, friendship, harper, harper collins, mars, moon, Oliver Jeffers, The Way Back Home on August 9, 2015 by thehungryreader. I just discovered the world of Oliver Jeffers and I can tell you with assurance that this is a world you would not want to get out of, once you get in that is. I have read eight books in the past two days – I agree that they are picture books, but they are books nonetheless and they have this immense power to transport you to another world or perhaps more than world – with their simple storytelling and illustrations. 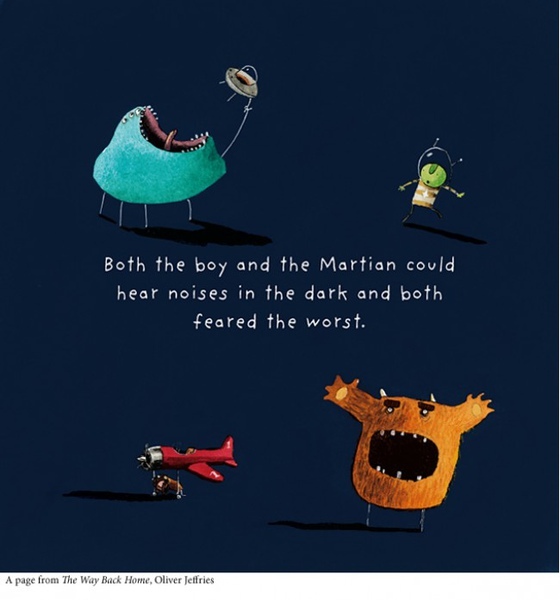 Oliver Jeffers’ books have this touch of fantasy and reality attached to them. It is almost like he makes you see what he wants to, without letting go of the innocence element. And according to me, perhaps adults have a lot more to learn from his books – about the nature of being a child again than children themselves do. 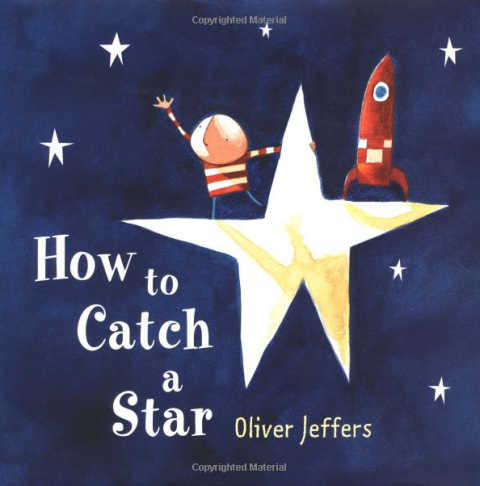 The book I started with was, “How to Catch a Star” – an endearing tale of a boy who wants his own star by his side and guess what! He actually manages to get one. How does he do that? Well, you have to find that out for yourself. I could not stop smiling at the end of this book. This is what Jeffers’ books do to you – they make you smile and that is enough, sometimes more than enough. The second one which I lapped right after this was, “Lost and Found” – a story of an unlikely friendship between a boy and a penguin. This is about how friendships are forged in the most unlikely places and how sometimes you just have to do what you have to, to make them work. Another picture book (well with text as well) to warm the soul. 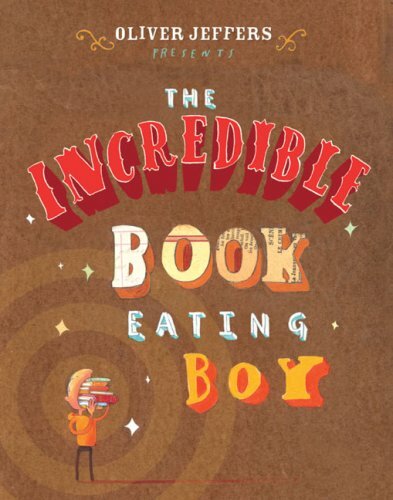 “The Incredible Book Eating Boy” is for all readers and the non-readers as well. It is delightful. It is adorable and it is about books and a boy who eats them and what eventually happens to him. This for the most obvious reasons has to be my favourite of all the eight books. 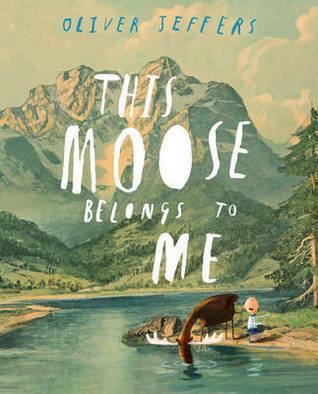 The fourth and the fifth then were, “The Heart and the Bottle” and “This Moose Belongs to Me” – both uncannily about letting go and finding love in places, one did not expect to. These books mind you are for kids and that is just fantastic about them – they teach without being preachy and at the same time, your child and you (hopefully) will appreciate the illustrations and stories that Oliver has to tell. 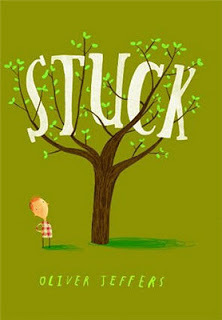 The sixth book which I read was, “Stuck” – a story about a boy and his kite which is stuck in the tree and what he does to get it back. It is hilarious, fantastical and almost a laugh-out loud book. 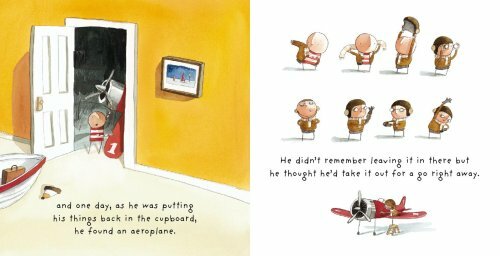 Oliver Jeffers has this quality to him – his books can make a dull day all bright and happy and that should be reason enough to read them. 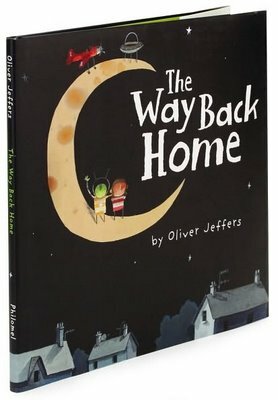 The seventh book which was a treat was, “The Way Back Home” – self-reflective of the title, a friendship on the moon between a boy and an alien and the need to go back home for both of them and how they manage that. The universal theme of home made me yearn for my own. It was simply beautiful. 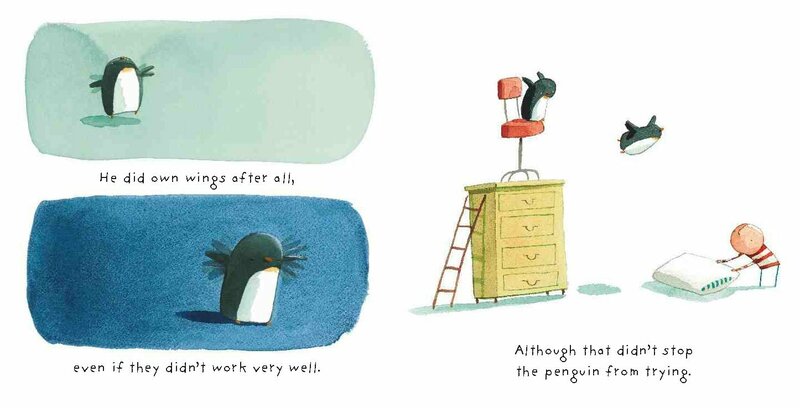 Last but not the least (he has for sure written more and I cannot wait to get my hands on all of them) was “Up and Down” – the continuation of the story of the boy and the penguin in “Lost and Found” another adorable story, well told. 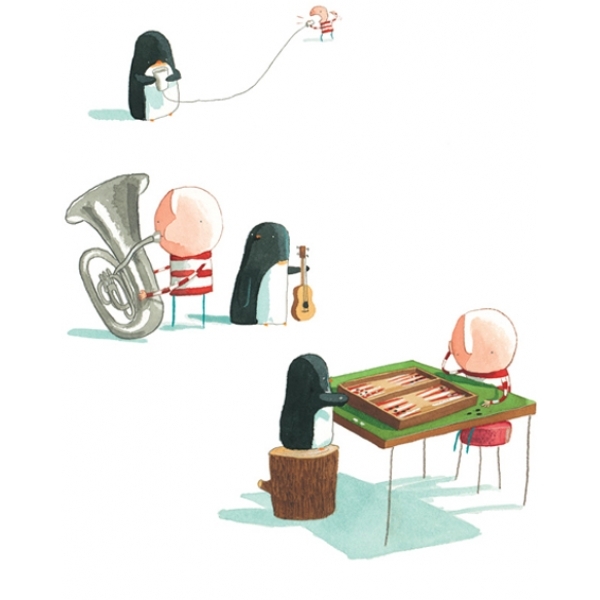 Oliver Jeffers’ books can be read anytime – over and over again. I most certainly will. Like I said, it just warms the soul. The illustrations are just perfect and so are the stories – meant for all. It just makes you see the child within you which is so needed in times such as these. And what I found is even better: A trailer for the movie Lost and Found. Can’t wait to watch the movie now. This entry was posted in Harper Collins, Harper Collins India, Oliver Jeffers, Picture Books, Review and tagged harper collins india, How to Catch A Star, Lost and Found, Oliver Jeffers, Picture Books, Stuck, The Heart and the Bottle, The Incredible Book Eating Boy, The Way Back Home, This Moose Belongs to Me, Up and Down on April 16, 2014 by thehungryreader.